Mark you calendars local Military San Antonio and New Braunfels readers, this one is for you. 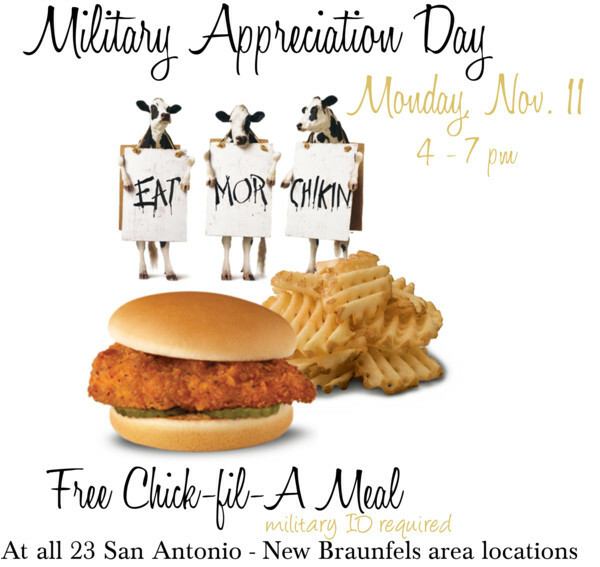 All 23 San Antonio-New Braunfels area Chick-fil-A® restaurants will honor local military personnel and their families with Military Appreciation Day on Monday, Nov. 11 from 4 to 7 p.m. All retired, veterans, and active duty military personnel are invited, along with their immediate family members, to enjoy a free meal at a local Chick-fil-A restaurant. Chick-fil-A® Nuggets (eight-count) or Chick-fil-A® Nuggets Kid’s Meal (four-count).